It’s not that difficult to create delicious and highly healthy fruit smoothies right in your home kitchen. Making fruit smoothies doesn’t take up much time and you would be able to save a great deal of money if you could just make a fruit smoothie on your own. The recipes for fruit smoothies are easy to follow so you don’t need to be that good in the kitchen to get them right either. When it comes to fruit smoothies, the strawberry banana smoothie is one of the greatest ones as it’s not just delicious but also delivers a lot of health benefits. Let’s take a look at some of the best strawberry banana smoothie recipes. 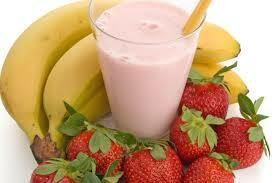 Apart from being extremely delicious, strawberry banana smoothies are very nutritious too. Every 8oz. 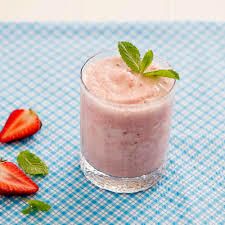 serving of a strawberry banana smoothie contains 53 calories, abundant Vitamin A, B12, C and D and there is less than 1g of fat in it. Combine the strawberries and banana in milk and then put the ice in the mixture. Keep blending it until it becomes completely smooth. Put a tablespoon or more of sugar in it. Blend it again for around one minute. This is a special strawberry banana smoothie recipe and one of its main benefits is that it’s pretty simple to make. It serves as a wonderful drink for breakfast as it can make you all fresh. This smoothie is an excellent dietary fiber source too. The addition of yogurt to the basic recipe makes it healthier as well. Put the ice cubes in the blender and then crush them. Add cold water over the ice cubes. Put the banana in the blender after slicing it into pieces. Add the yogurt and strawberries in the blender. Keep on blending it till it all becomes smooth. If it starts to get too thick then add a bit of water again. Thismakes a wonderful drink. What makes this combo more delicious is that the honey lends a beautiful sweetness to the smoothie. 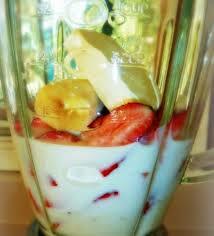 Put the bananas and strawberries in the blender along with vanilla yogurt. Now add the honey and the wheat germ. One of the most mouthwatering strawberry banana smoothie recipes is the one with mint. It’s not only very tasty but it also has a lot of health related benefits since it contains Vitamin C, antioxidants and potassium, not to mention that it’s refreshing. This one serves great as a replacement for a snack late in the afternoon. Wash the strawberries at first and then dice them. Create slices of around 1 inch each out of the two bananas. 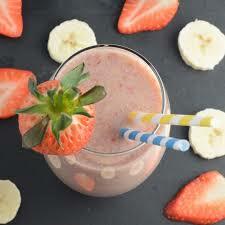 Put the sliced bananas and diced strawberries in the blender along with ice and milk. Blend the ingredients on a low setting and stir the mixture a few times. Add the mint sprigs over the mixture once it has become smooth. 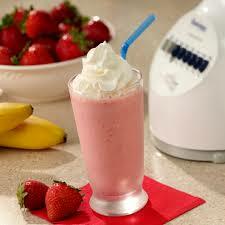 The strawberry banana smoothie recipe with ice cream can help you create the most delicious smoothie ever. Apart from being truly awesome taste wise, it has got great health benefits too as explained just now..
Wash the strawberries and remove the leaves. Slice each banana into three halves. Add the bananas and strawberries along with ice cubes and sugar in the blender. Put the vanilla ice cream scoops in the blender. Keep on blending it till the mixture starts to look smooth. It’s always best to use fresh ingredients in the smoothie as the flavor as well as the nutritious value is highest in fresh ingredients. If possible, also look to use as many organic ingredients in there as possible to improve the nutritious value and to better the taste. If you like the use of ice cubes, then you should create ice cubes out of coconut water. They won’t just add a flavor to the smoothie but would also deliver important electrolytes like potassium and magnesium. If you like your smoothies to be chilly then you should actually freeze them. Freezing fruits is a great way of ensuring that they don’t go wasted. To improve the nutrition value of the smoothies you drink, you can try a gel consisting of water with chia or hemp seeds rather than water alone.